Namco Bandai wants you to create a piece of equipment for the upcoming Dark Souls II. When Namco Bandai first started to promote the original Dark Souls, it struck upon the idea of hyping the game by asking players to design a shield for inclusion within the title's armory. This made a lot of sense as shields are basically flat hunks of metal with plenty of space for creative heraldry (or, as the results of that contest proved, worryingly detailed drawings of male genitalia). Now, with the original Dark Souls officially a huge success Namco Bandai has understandably decided to repeat the "Design A Shield" promotion for its upcoming sequel. Interested? Joining the contest is simple. Just visit the official Dark Souls II Facebook page between May 13 and May 20 to submit your design. 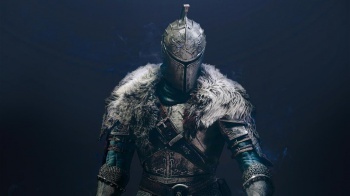 The community will then vote on its favorite designs, with the final six being selected by the development team at From Software for inclusion in the game. Obvious inspirations for this contest will come from medieval Europe, so might I suggest thinking outside the box a bit? Dark Souls takes place in its own, relatively unique fantasy setting, where the most heroic figure is effectively a shambling corpse, right? So why not design something to reflect that? If you want to go highbrow you could create a shield reminiscent of a classic memento mori piece - skulls within eyeballs and what not - though it might be more fitting to throw together an anatomically correct close-up of a zombie's crotch. This is the internet, after all. Pictures of dude-junk are basically currency around here.